So I don't quite know how it happened but I agreed to take Brownies on a 4 day camp, quite a distance from home to help a fellow Guider/friend out. I'm sure she used the words "you only have to turn up" at the point where I said yes! But we all know life is never that easy! So camp prep began with decorations. And piles of kit mounting. And we were there. 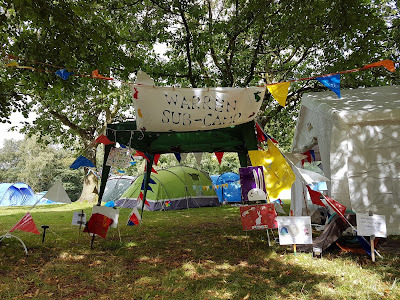 Brownies are not Rangers (clearly) so they were never going to put up their own tents but we got them involved as best we could and did the usual shouts of "don't stand on the tent...push the poles, don't pull them" - it's a camp call that echoes across all Guiding fields! It was not helping that we suspected these tents had not been out since my rangers last had them so the unpicking of knots was tiresome and my Rangers were suitably admonished online! But quicker than expected we were all up and my favourite sleeping arrangement was in place. Our sub-camp was organised by a very small team and they did very well given their numbers. We had almost constant hot water, cold drinks, snacks etc and our day tent was only this far from the urns. Lots of hot tea always makes me happy. All catering and activities were provided and it was all pitched perfectly. The activities were organised fantastically, they were varied and well controlled but the brownies had lots of freedom to choose and come and go as they pleased. I was really impressed. The catering was good. The food was good. The queuing system and time settings were sometimes not as fast as I would have liked but the brownies didn't seem to mind and we were all fed in time for activities and events, and the one night when dinner settings ran over they moved the start times of the activities to accommodate that. There were day time craft activities, technical things like film animation. Active things like wall climbing, zip wire, greasy pole, go-karts, low ropes, pond dipping, geo-caching. 'Guide like' things like fire starting, smore making, hammocks. The evening activities included beetle, bingo, a film (with popcorn), night hikes, opening and closing ceremonies, disco, campfire. I'm sure I will have missed so many good things that they did off the list, mostly because I didn't see them do it. Partly because I was mixing with other guiders doing important guider things like eating cake and drinking tea but mostly because I volunteered as often as possible to help with activities. I spent a morning and afternoon helping an instructor at a climbing wall. My Facebook status for the day was: "I have learnt so much today about leadership and motivating young kids to push their boundaries. All from a 19 year old Scout. I am totally humbled by him. Incredible, he did it for 5 hours without faltering giving each kid the same experience and never letting the safety procedure drop once." He was so good at talking the frightened girls up a notch more (and most to the top) and calming the excited ones to be controlled. He was studying something like Maths or Nuclear Physics I think I recall - wasted talent - he should be a top paid climbing wall instructor - the confidence of the youth today needs him more than any university! The campfire was run by the Guider that does the best campfires in the country (in my opinion) so that was faultless. I went on the night-hike both nights it was run to be an extra adult - you know me and walking!! It wasn't very quiet!!! It was the nights of the meteor showers, it was clear so lots of brownies were pointing at planes in the sky shouting "is that one, can I make a wish now?" !! After the girls were in their tents we sat out in our camp chairs watching the shooting stars. It was a lovely time. One morning I volunteered to help with the fire steels (I'm rather good at that now!) so I went down to the area. And got put on basket weaving *sigh* It's a guider's lot!! But at least the whole area smelt of lovely wood smoke. That afternoon we had our star challenge where the girls went round stalls earning stars by playing games or filling in booklets and then spending those stars on things like rodeo unicorns, bouncy slides, ice-creams and candyfloss. The pac-man game was a very popular one, it was great fun as I was sat right near it watching the girls play. We'd taken pegs with us and introduced our Brownies to the challenge. One of our girls managed to peg the Region commissioner without her knowing. This seems childish but it is great camp fun, I also think it was a huge challenge for the girls as they had to do it and leave quietly. They desperately wanted to stand and point, or laugh and be caught so they could show how clever they were doing it. But to peg and leave without a leader helping, without giving each other away and without being caught shows maturity and stealth. They impressed me that they could do it. The last night of any large scale camp (this was large scale for Brownies) is a special time, there is something about the atmosphere. The girls were not quiet in the tents when they went to bed! But they settled quickly after "lights out" and ours were especially good in that none got up in the night once the whole camp. The last morning started fine, which is great news for tent drying. I showed the others my guy rope tying skills. And I learnt how to make a cob house. We took the girls for the hike they did at night during the day so they could see what they couldn't see before! And we had a picnic before the final push to get all the tents down and home. Camp is special in so many ways. And large scale camps even more so as you have your chants and sense of belonging. There were about 300 at this camp (I believe), big enough to feel large scale, small enough to be controlled and safe for brownies. I recommend this camp to any brownie leader and if you haven't gone under canvas before it's a great one to start with as it is fully catered, all activities provided (seriously we didn't take a thing in terms of time fillers) and fully staffed, you only have to think about the camping part.